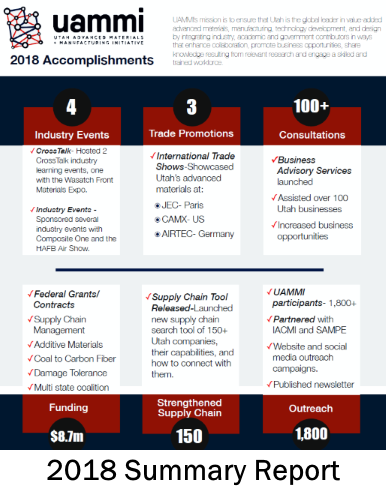 As 2018 draws to a close we have taken stock of the activities we accomplished this past year and compiled them into a summary report below. For all of our supporters, stakeholders, and partners, this summary will display the outcomes of your support. We intend to stay true to this mission and do all we can to bring awareness and new business into Utah’s advanced materials and manufacturing industry. We have exciting plans for 2019 and are eager to work with our partners, industry leaders and state representatives to achieve them.